Slowflowers.com is a free, nationwide, online directory to 700+ florists, shops, studios and farms that supply American Grown Flowers. Ongoing promotion, marketing and media outreach generates annual traffic of 29k unique users and 191k page views. The Slow Flowers brand was trademarked in 2015. It encompasses five media channels, including Slowflowers.com (the directory), the Slow Flowers Podcast with Debra Prinzing, American Flowers Week, the Slow Flowers Summit and the Slow Flowers Journal, which is co-published with Florists' Review magazine. Click here to view and download our Sponsor Menu. If you're interested in supporting Slowflowers.com with a banner or badge "ad," read on to find out more. We welcome advertising from floral-related sources whose businesses are aligned with the mission and content of Slowflowers.com. Your ad will appear as a horizontal banner ad across the bottom of the web site or as a square badge in the right-hand sidebar. 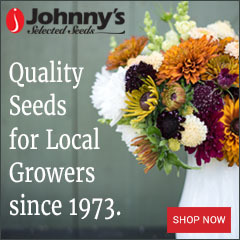 By sponsoring the site, you are helping support our effort to connect consumers with florists, shops, studios and farmers who grow and source domestic, American flowers. $50/month for a minimum 3 month commitment ($150 for one quarter; $275 for 6 months; $500 for 1 year). Specs: 320 x 100 pixels. $100/month for a minimum of 3 month commitment ($300 for one quarter; $550 for 6 months; $1000 for 1 year). Specs: 240 x 240 pixels. Contact advertise@slowflowers.com with your inquiry. How do I pay for my banner ad? Once your ad is approved, you will be sent an electronic invoice to pay using a credit card. Upon payment, your banner or badge will go "live" for the period you select.